WATER SOFTENER service is normally recommended on an annual basis as it is for most other water filtration equipment, however, your situation may dictate a different service interval. Water softeners and other water filtration systems work hard as they process thousand of gallons of water monthly, removing unwanted contaminants and minerals from the water. It is possible to have interim operational problems (identified later in this report) which can be diagnosed and remedied by the homeowner. To ensure proper operation, minimize the need for water softener repair and to maximize the useful life of your equipment, proper maintenance will provide consistent softened or conditioned water to your home. There are various brands of water softeners, some more efficient than others in terms of water usage and salt requirements. Some models are capable of softening or conditioning larger volumes of water, therefore estimating water usage prior to selecting a system is important. For higher levels of iron and/or manganese, an up-flow water softener (versus down-flow) is highly recommended to avoid damaging mineral build-up at the bottom of the tank. For complicated problems, contacting your water treatment service technician for water softener repair is your best option. See symptoms of problems with your water softener below. Check the Brine (or Salt) Tank: Is there salt in the tank? If not, add at least a few bags of salt to the tank. Check power to the softener: If the unit uses electricity to run a timer, be sure it’s plugged in to a live outlet and has power. Some water conditioners use a low-voltage transformer to power the control – be sure that device is present, plugged in, and working. Also, a power failure could cause the timer to be improperly set. Re-set the day of week and time of day on the water softener timer after an electrical power failure or after the softener has been powered “off” for a time. 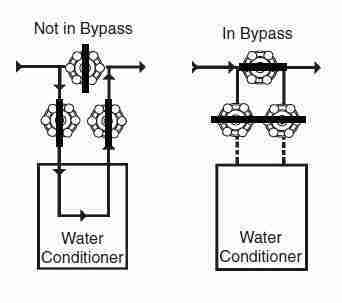 Check water softener bypass valve: You want first to see that the water softener is not on “bypass” – is household water flowing through the unit? This valve is an option and may not be installed on your unit, but there may be standard plumbing valves or globe valves that accomplish the same purpose. Manual regeneration cycle: Then try a manual regeneration cycle – you’ll see on most units a lever you can push on the control box to start that regeneration process. Note: your home will not be delivered conditioned or softened water while the water softener is in the regeneration cycle, therefore, its best not to use water (or use as little as possible- flushing toilets is OK, etc.) in the home until the regeneration process is complete. This is why most programmed regeneration is set for late at night when water usage is much less likely. Feel and test the water supply: if you can’t get a lather when bathing the system may not be sufficiently treating the water. Without fully diagnosing, it can be very difficult to determine what is really causing the problem and whether of not a water softener repair is even necessary. This is where a service technician will be able to trouble shoot the situation and come to a determination and solution to the problem. While there are so many possible symptoms and problems a softener may experience, the following are a few that you may see. Hard water evidence observed right after a regeneration cycle. Before deciding whether or not to have a water softener installed, you should start with a water test. This is the only way to determine what potential minerals and contaminants you have in your water and how much. Specifying the right type of water softener or other water filtration equipment cannot be determined without this information. Very small amounts of iron or manganese, for example, can have a very large impact on your home’s water quality. Hydrogen sulfide is evidenced typically by a rotten egg smell in your water. This may also be caused by high Managanese levels in the water as well. This problem is easily correctable with a water filtration system design specifically for this purpose. Not only might there be aesthetic affects such as staining of fixtures and laundry, bad odors and taste, but there may also be health threat contaminants as well. Private wells in Stratham, New Hampshire should really be tested for arsenic in water and radon in water as well as a number of other parameters. Speaking to your water treatment professional or a certified water testing laboratory will guide you in the right direction. For more information on arsenic in water see the link at https://h2ocare.com/arsenic-removal/. For more information on how to remove radon in water see the link at https://h2ocare.com/radon-removal/. H2O Care is an established regional, full service water filtration and testing organization, originally formed in 1989. See our written and published articles in Water Technology Magazine by going to our website, http://h2ocare.wpengine.com and going to the publications photo on the home page or the tab at the top of the home page. We can be reached by email at service@h2ocare.com or by calling us at 800-539-1100.